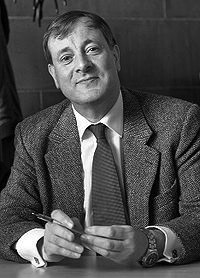 Alister Edgar McGrath is a British Irish theologian, priest, intellectual historian and Christian apologist, currently Professor of Theology, Ministry, and Education at Kings College London and Head of the Centre for Theology, Religion and Culture. He was previously Professor of Historical Theology at the University of Oxford, and was principal of Wycliffe Hall, Oxford, until 2005. He has also taught at Cambridge University and is a Teaching Fellow at Regent College. McGrath holds two doctorates from the University of Oxford, a DPhil in Molecular Biophysics and a Doctor of Divinity in Theology. He is an Anglican and is ordained within the Church of England.McGrath is noted for his work in historical theology, systematic theology, and the relationship between science and religion, as well as his writings on apologetics He is also known for his opposition to New Atheism and antireligionism and his advocacy of critical realism. Among his best-known books are The Twilight of Atheism, The Dawkins Delusion, Dawkins' God: Genes, Memes, and the Meaning of Life, and A Scientific Theology. He is also the author of a number of popular textbooks on theology.